The Lenovo Tab 4 8 and Tab 4 10 tablets are finally up for preorder. Lenovo introduced them back at Mobile World Congress in Barcelona where I had the chance to take a closer look at them. They’re quite interesting because they offer decent hardware with Android 7.1 Nougat at an affordable price. You can preorder the Yoga Tab 4 10.1-inch starting at 179,99 USD at Amazon. The 8-inch version is even cheaper with a price of just 129.99 USD. As I said I already played with them quite a bit during a tradeshow where they were announced. Here are my first impressions. The design of the Lenovo Tab 4 tablets is quite simple. That’s what we expect from super cheap devices though. While the body is completely plastic it feels much better than the previous Tab 3 series from last year. I like the build quality better than the one from the Amazon Fire HD 8. There’s a nice texture on the back which does not make the tablets feel cheap. Even though they are. Unlike with the Tab 4 Plus models, we’re not getting a fingerprint reader here. Lenovo is offering us a USB Typ C-Port and a MicroSD card slot though. On the back sits a 5-megapixel camera while the front camera has a resolution of 2 megapixels only. The Lenovo Tab 4 8 and Tab 4 10 have the same internal hardware but the displays are different. As you might have guessed from the names we’re getting an 8-inch and 10.1-inch display. Both have the same HD resolution at 1280 x 800. While the pixel density if fine for an 8-inch panel the 10.1-inch version would look nicer with a higher resolution. Inside runs a Qualcomm Snapdragon 425 SoC which is not the fastest processor out there but offers a better performance than the 1.3GHz MediaTek from last year. The Snapdragon 425 is a lower mid-range chip that’s also found in a couple of cheaper smartphones. We’re also getting 2GB of RAM and an internal storage with a capacity of 16GB. As mentioned before you can expand the storage with a microSD card. 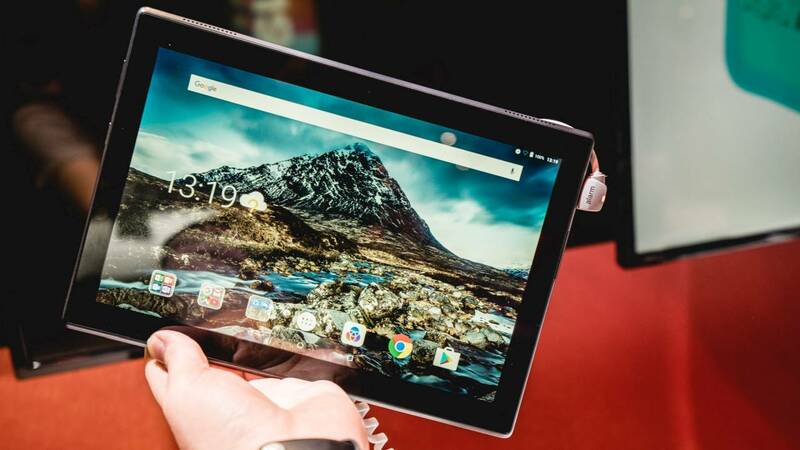 There aren’t a lot of tablets shipping with Android Nougat right now and the Lenovo Tab 4 8 and Tab 4 10 will be one of the few running Android 7.1 Nougat already. As far as I have noticed at Mobile World Congress Lenovo did not customize the interface a lot which is awesome. You’re almost getting vanilla Android with a couple of apps preinstalled including the Office 365 apps from Microsoft like Word, Excel, and OneDrive. My first impressions of the Lenovo Tab 4 8 and Tab 4 10 are quite good. They offer a couple of improvements compared to the previous generation and are running up to date software. Once they are available I’ll work on a complete review – I can’t wait! The Lenovo Tab 4 8 offers a solid build quality, good performance and a decent battery life. It's also running pretty recent Android 7.1.1 Nougat without being customized too heavily. One of its few downsides are the low 8-inch resolution screen.